I really strive to keep my closet full of classic pieces that can carry me through the seasons year after year. After streamlining my closet and going through a frightening mess of clothing (I definitely had several "what was I thinking when I bought this?!" 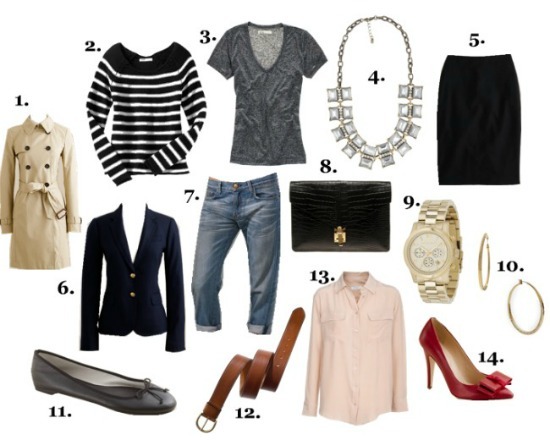 moments), I wanted to put together a list of items that I feel are classic wardrobe staples. I love that all of these pieces are versatile, timeless and can be mixed and matched. For me, there's nothing better than a pair of boyfriend jeans worn with comfy flats, a grey t-shirt, a chic clutch and simple gold hoops to achieve that effortless yet put together look. Have a great weekend! Amazing Post!! Love every item on Your List! Sharing it on my Facebook Page! I love 1, 2, and 7! I definitely need a pair of boyfriend jeans but haven't found the right ones yet. You always rock them so well! Number 7 is right up my alley! NEEDING a pair of boyfriend jeans!! I love that blazer! Definitely my favorite! And that striped top is a necessity. I wear striped WAY too often! Check, check, check! Though from different brands, I have all these elements, great selection! Happy weekend! I agree with all your picks especially those J.Crew pieces. I love J.Crew in general. Happy Friday, Audrey! I agree on all 14. Every single piece stands the test of time and style. But it's always great to see them listed like this. I'm going to print this out and put it on my inspiration board. Lovely picks..I love them all they're so cool & chic! Great post - my fave is the necklace!! I think your wardrobe is great. I would take it immediately:) These pieces are amazingly chic, yet classic. I am seriously craving for those j.crew bow pumps. I didn't include boyfriend jeans and thinking I should have...i LIVE in mine...you can dress up and down...total staple. LOVELY, all your outfits are so classic and casual at the same time! I agree with all of your staples!! You can't go wrong with a basic t, a striped sweater, skinny jeans, trench and flats. These are total must haves in every wardrobe. And they are the perfect go to's for those days when you can't figure out what to wear! for sure is a list with timeless pieces! I really need to invest in a blazer and a quality pair of jeans. Those two things seem to never go out of style. Love your idea of the perfect effortless/put together look. I need to put more effort into making my looks more effortless, haha! Great staples! I love seeing what other people consider their "staples". Great picks! I'd love if you stopped by Tulips&Tulle sometime! Vous travaillez beaucoup! Après fabuleux et superbe sur le plan de la mode connexes. Les robes sont vraiment belles. This is such a great list. I'm using it as a packing guide right now!